(Photo Courtesy/Mike Beiermeister) From left to right-Diane Sims, Trooper Ashley Simpson, Keli Werda, Bradley Somers, and Kelli Sheehan pose for a check presentation. 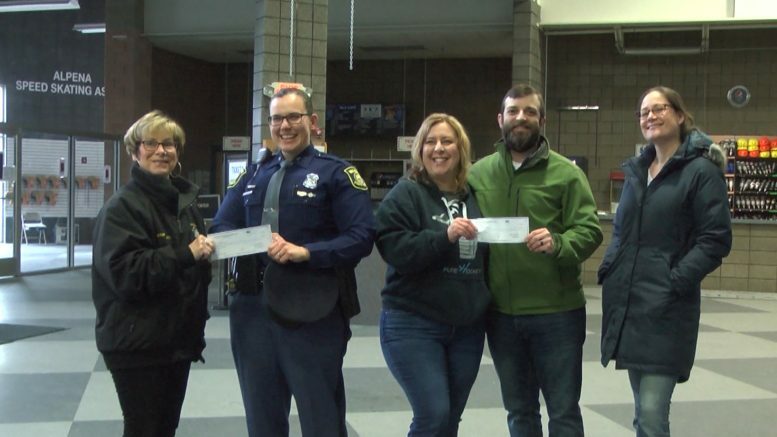 Alpena, Mich — Two local organizations received a nice monetary boost thanks to an annual hockey matchup featuring Alpena’s police and fire departments. Over $2,000 dollars was donated to the Boys & Girls Club of Alpena and the Victim’s Advocate Group that works with the Alpena County Sheriff’s Office. The Boys & Girls Club received $1,000. The Victim’s Advocate Group received $1,300. Local police officers and firefighters helped raise money through their annual ‘Battle of the Badges Charity Game’ which is held at the Northern Lights Arena. “Money like this really helps us to better meet the needs of the kids that we have, that attend our facility, and, in turn, better fulfill the obligation that we have in the community by providing these specialized activities for the kids ,” said Boys & Girls Club of Alpena Executive Director Bradley Somers. Both organizations were very happy to be receiving vital funding to help continue their work in the community. Battle of the Badges started back in 2002 in Alpena. Since then, the event has helped raise well over $25,000 dollars for local nonprofits and groups.